Europium oxide has two common structures: Monoclinic (mS30, SpaceGroup = C2/m, No. 12) and cubic (cI80, SpaceGroup = Ia-3, No. 206). 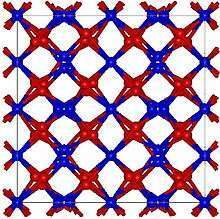 The cubic structure is similar to that of manganese(III) oxide. It may be formed by ignition of europium metal. It can react with acids to form the corresponding europium(III) salts.